From Thursday evening to Sunday afternoon Le Richmond in Griffintown will be hopping with parties, dinners and brunches all weekend long. Their parties have become legendary on the GP circuit and this year promises to be even bigger. Things at Le Richmond begin revving up on Thursday with the Kickoff Party in collaboration with Johnny Walker. The entertainment by Black Mohawk promises to be mind-blowing. Friday night features the return of the Gentlemen’s Club. Billed as a night of “flirting with the forbidden”, the Gentlemen’s Club is an elegant and opulent evening that will have you dreaming of the best cabarets in Old City. Saturday night is the Red Carpet Party. Taking a page from Hollywood’s book and turning it up like only Le Richmond can, get ready for one of the biggest parties of the weekend. Come dressed extravagantly chic and sip on Piper-Heidsieck all night long. After partying the night away, come back to Le Richmond on Sunday morning for the Duval Le Roy race party. Featuring a festive brunch, Le Richmond will close out the weekend with as big a bang as when it started. Of course you can’t mention the words Grand Prix without thinking of l’Auberge Saint-Gabriel. Every year they throw a series of bashes that can’t be topped (until the next year when the go bigger than before!) and this year is no different. The party starts simmering on Thursday with a celebratory red carpet BBQ manned by non other than Martin Juneau. He’s designed a spectacular menu for the event that’s expected to be one of the biggest of the weekend. Celebrities, VIP guests, media and other attendees are all expected at this very special red carpet event. For more info, click here. The party heats up on Friday night with an evening inspired by the wild nightlife of Paris. Presented by l’ARC Paris, one of the world’s most prestigious nightclubs, Paris Mon Amour will be the talk of the town and feature surprises that l’Auberge is famous for. Find out more here. Saturday night is the biggest night of the weekend with the city so full of visitors, it’s impossible not to catch Grand Prix fever. At l’Auberge they are doing their yearly Bagatelle Brunch and at night things will get crazy at la Folie du Grand Prix. World renowned DJs, amazing atmosphere, great cocktails and a setting like no other, you need to have this one on your list. For more, click here. The party continues on Sunday with yet another big party at l’Auberge Saint-Gabriel. International celebrities, models, drivers and more attend the Formula 1 Grand Prix du Canada closing party every year making it one of the most exciting. With the races all over and the adrenaline still pumping, Sunday night is no night to relax and take it easy. For more, click here. 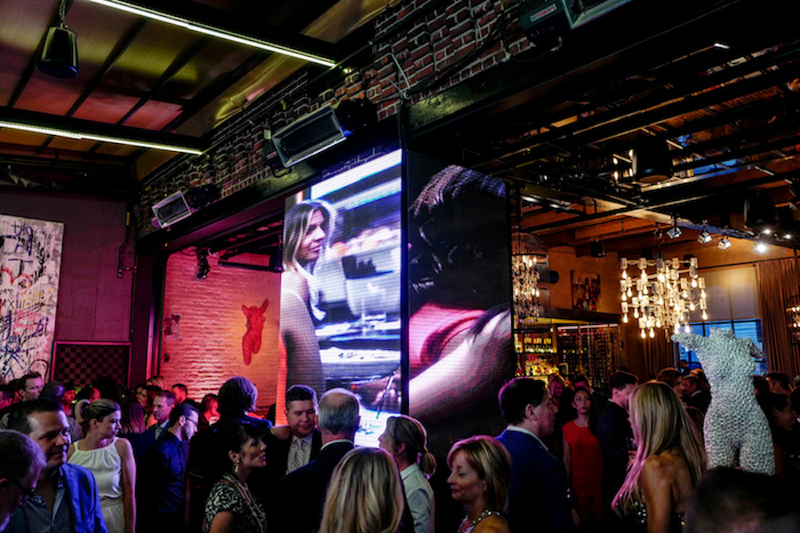 Wunderbar, EAT and the Plateau Lounge in the W Hotel Montreal will all feature so many events during Grand Prix that it’s hard to imagine there will be enough time to fit it all in. DJ Larry Paiment starts the party at 5pm on Thursday and continues all night long under the the theme of “Rebirth of Cool”. At the Plateau Lounge guests are invited to get “Dressed to Kill” with DJ Lost Heroes and DJ Leryck. On Friday night get started on 5pm again with DJ Florence at Wunderbar before continuing with even more DJs. At Plateau Lounge DJ Quest leads the charge beginning at 6pm and EAT joins the pack with a special Grand Prix infused dinner accompanied by DJ Jabig. Saturday and Sunday the party continues with a special brunch and dinner at EAT while things continue to heat up at Wunderbar and the Plateau Lounge. DJs Kurtis C and DJ Splyce keep the vibes revving up at Wundebar while Toddy and Jojo Flores put the petal to metal in the Plateau lounge for “Night Call” on Saturday night. Things begin to simmer but get far from calm on Sunday with brunch at EAT powered by the sounds of DJ Donald Lauture. 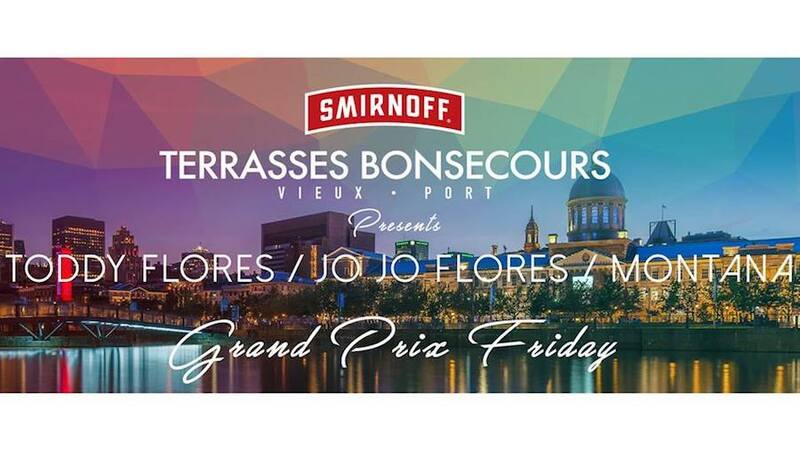 Let the breeze of the Saint-Laurent keep you cool as the party heats up on Friday at Terrasses Bonsecours’ Smirnoff Grand Prix party. DETAILS: Music: Toddy & Jojo Flores // Montana and Friends. Free Smirnoff samples for those who are vodka included and there promises to be plenty of giveaways. Free entry if you dare to wear red. On Saturday Terrasses Bonsecours features one of Montreal’s most anticipated brunch of the year! The Grand Prix Tiki Brunch at Terrasse Bonsecours will be one of the parties you won’t want to miss during the Grand Prix weekend (it’s top on our list). Beginning at noon with a welcome Flower lei and a Miehana cocktail, the view of the city, the river and the crowd promises to be breathtaking. Appetizers to keep the hunger at bay and a tiki inspired cocktail making lesson fill out the party. DJ Yo-C provides the soundtrack as guests are surrounded by tiki torches in the Hawaiian island inspired garden. On Sunday Terrasses Bonsecours does what it does best with the Grand Prix Boozy Brunch. Those who’ve experienced the brunch know that this is not to be missed. Just because it’s Sunday, doesn’t mean the party is over! SOMWHR is one of the city’s hottest venues and during Grand Prix the heat will rise. Crowds of the Montreal’s most beautiful people swarm to SOMWHR on a weekly basis and during Grand Prix expect that to be no different. From Thursday night to Saturday each wild night out will feature bottle packages for their high end guests, special guest hosts each night and celebrity spotting all in one of the wildest hotspots in Old Montreal. If you’re looking for an exclusive, VIP Grand Prix weekend experience, look no further than SOMWHR!